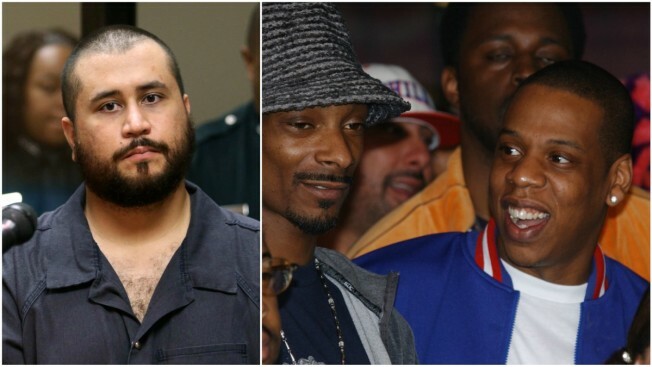 Snoop Dogg has responded to threats leveled at Jay Z from George Zimmerman. If George Zimmerman wants to harm Jay Z, he'll have to go through Snoop Dogg to get at him. A report of a recent threat from Trayvon Martin's killer that he would "beat" and feed Jay Z "to an alligator" resulted in a quick response from the rapper. "If one hair on jays hair is touched that’s when the revolution will b televised," Snoop Dogg wrote on Instagram. "Trayvon Martin Gone but not forgotten." Zimmerman's threat was reportedly leveled during an interview with celebrity gossip site The Blast, in response to Jay Z's upcoming docuseries about Martin, "Rest in Power."